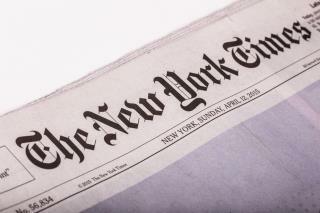 (Newser) – The New York Times website gets approximately 9,000 comments per day from around 60,000 unique monthly commenters, according to the venerable newspaper. Out of those hundreds of thousands of comments, we now know the most popular—and shockingly it doesn't include the words "libtard," "Obummer," or "Donald Trump" anywhere. According to Canoe.com, the top Times comment of all time was left by a Canadian man under the name "Bob" on a 2010 Paul Krugman column titled "The Angry Rich." Bob's comment—which the Huffington Post describes as an "ode to Canada's greatness"—has received more than 7,000 recommendations to date. I wouldn't commit much crime either if I was frozen 11 months a year. My Cousin is a Charge Nurse at Buffalo General Hospital, right across the bridge from Canada. This hospital has many Canadian's at all times. The people pay cash for health care! Tens of thousands of dollars for heart bypass and all manner of other ailments. The waiting lists for even simple life saving procedures in Canada are long. The system is broken in Canada, Buffalo NY has the hospitals with the patients to prove it. And, my American friends, you could have all this (all that Bob raves about) too. Although one thing, Alberta (the province Calgary is in) is/was our most prosperous province due to oil. Sort of a modest version of Texas, conservative by world standards, and freedom loving like all Canadian provinces. Probably more than half of our provinces have infrastructure difficulties with old bridges and freeways, and income taxes 5 to 10% more than in the USA. But still, think about what percentage of your income goes on the hospital and doctors visits part of your health insurance. Probably that alone is more than the difference in income tax. "Universal medicare for all", top quality public schools for all, and more affordable tutition fees are definitely things that a freedom loving American should seek from their government. What is the point of even having a government when it fails so badly at educating working people and keeping working parents healthy? Why is parental leave something that Americans should be banned from having merely because of their misfortune at being born in the wrong country? These are simple things to fix. Professionals, tradespeople, middle managers and rank-and-file workers should be refusing to live in a second rate nation and demand their government organize for them the sort of facilities that governments in first world countries provide their citizens. The USA has the people, the money and the resources to be the best nation on earth. It is time people there who work for a living stand up to the idle rich and demand both their political parties end their war on the middle class.